Received: April 11, 2018; Published online: June 30, 2018. Tau protein is encoded in the microtubule-associated protein tau (MAPT) gene and contributes to the stability of microtubules in axons. Despite of its basic isoelectric point and high solubility, tau is often found in intraneuronal filamentous inclusions such as paired helical filaments (PHFs), which are the primary constituent of neurofibrillary tangles (NFTs). This pathological feature is the nosological entity termed “tauopathies” which notably include Alzheimer’s disease (AD). A proteinaceous signature of all tauopathies is hyperphosphorylation of the accumulated tau, which has been extensively studied as a major pharmacological target for AD therapy. However, in addition to phosphorylation events, tau undergoes a number of diverse posttranslational modifications (PTMs) which appear to be controlled by complex crosstalk. It remains to be elucidated which of the PTMs or their combinations have pro-aggregation or anti-aggregation properties. In this review, we outline the consequences of and communications between several key PTMs of tau, such as acetylation, phosphorylation, and ubiquitination, focusing on their roles in aggregation and degradation. We place emphasis on the structure of tau protofilaments from the human AD brain, which may be good targets to modulate etiological PTMs which cause tau aggregation. Tau protein functions in the regulation of axonal transport of proteins, neurite outgrowth, and microtubule assembly dynamics in neurons (1). Tau is encoded by a single MAPT (microtubule-associated protein tau) gene on chromosome 17q21.31 that spans 16 exons, among which exon 2, 3, and 10 are alternatively spliced to produce six major tau isoforms (2). Tau isoforms contain different numbers of N-terminal inserts (N-domain; 0N, 1N, or 2N) and microtubule-binding domains (MBDs) with highly conserved and repetitive regions (3R or 4R; Fig. 1). Tau isoforms are differentially expressed during development; while the fetal brain predominantly has the shortest isoform of tau (0N3R), the adult human brain expresses all six tau isoforms, including 0N3R, 1N3R, 2N3R, 0N4R, 1N4R, and the longest, 2N4R, with 441 residues (also called as tau441 or tau40) (3). This developmental change in expression at the molecular level results in elevated neuronal plasticity at the cellular and tissue levels. Tau isoforms appear to have a similar tendency to aggregate into intraneuronal filamentous inclusions such as paired helical filaments (PHFs) and straight filaments (SFs) (3, 4). 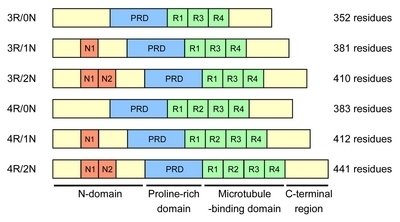 Tau protein consists of four functional domains: the N-domain, the proline-rich domain (PRD), the MBD, and the C-terminal region (Fig. 1). Although overall, tau is exceptionally hydrophilic (−0.87 of grand average of hydropathicity; ref.) with a net basic charge (pI of tau = ~8.2), the N-domain contains multiple acidic residues (pI of the N-domain = ~3.9), primarily interacting with non-microtubular proteins such as a membrane-binding protein, annexin 2 (5). Therefore, the N-domain may regulate the subcellular localization of tau in the neuron and function as a spacer to keep microtubules separated in the axon. The PRD contains seven PxxP motifs, which share a common feature with Src homology-3 (SH-3) ligands, suggesting that tau may have a role in intraneuronal signal transduction. Each repeated regions of MBD (from R1 to R4) consists of 18 amino acids, including KXGS motifs. Tau is considered to associate with microtubules through their conserved KXGS motifs for microtubule stabilization. The driving force for this association is the electrostatic interaction between the positively charged Lys residues in the MBDs and negatively charged microtubules. This may be the reason why tau is unbound from microtubules when it is hyperphosphorylated (6). Notably, most missense and intronic mutations found in tauopathies are clustered in the MBDs such as G272V, P301L, P301S, and V337M, which generally decrease the affinity between tau and the microtubules (7). It is, however, apparent that these mutations alone are not, either functionally enough to cause the disease, or directly associated with any neurodegenerative diseases. The role of the C-terminal region is still unclear but, along with the N-domain, it appears to impede tau polymerization (8, 9). Tau protein is an intrinsically disordered protein with a weakly defined secondary structure, as confirmed by various structural analyses including in silico sequence analyses, circular dichroism (CD) experiments, nuclear magnetic resonance (NMR) spectroscopy, and single-angle X-ray scattering (SAXS) techniques. Consistent with their little known genetic association with tauopathies, these aggregation-promoting mutations caused no significant conformational changes in tau. However, binding to microtubules via MBDs may confer an ordered structure to tau. The loss of this interaction, for example due to tau phosphorylation, in part allows tau to acquire highly ordered β-sheet structures to facilitate tau aggregation as shown in several in vitro and in vivo models (10–12). Because hexapeptide motifs of tau, 275VQIINK280 and 306VQIVYK311, which are located in R2 and R3 of the MBD (Fig. 2A), have a strong β-sheet-forming properties, they may provide tau with additional conformational rigidity, forming seeds for PHF or SF. Metal ions in neurons may facilitate the process of tau oligomerization and influence the final configuration of tau-metal co-aggregates with or without the involvement of tau phosphorylation (13, 14). Initially, the MBDs were thought to be both sufficient and necessary for tau or MBD fibrillization (15). However, a recent cryo-electron microscopy (cryo-EM) study using AD brains identified that the filament core of tau does not consist of complete MBDs but rather, only amino acid residues 306–378 (i.e., spanning R3, R4, and a part of C-terminal region containing a number of Lys residues; Fig. 2B), and the remaining portion functions as the fuzzy coat (16). In the study, the core of tau filaments contained only one hexapeptide motif 306VQIVYK311 and one of two Cys residues (only Cys322 but not Cys291; Fig. 2A and 2B) of tau, possibly forming the disulfide bond between tau proteins, suggesting that the K18 constructs containing the MBDs of tau may not represent the actual tau aggregates in vivo. A wide range of posttranslational modifications (PTMs) occur on tau, which include phosphorylation, glycation, nitration, O-GlcNAcylation, acetylation, oxidation, ubiquitination, sumoylation, methylation, and truncation. They directly or indirectly result in altered tau conformation, function, and even concentration in neurons. The neurofibrillary tangles (NFTs), a neuropathological hallmark of Alzheimer’s disease (AD), contain excess filamentous tau proteins that are hyperphosphorylated. A similar manifestation is observed in other neurodegenerative diseases such as frontotemporal dementia and parkinsonism linked to chromosome 17 (FTDP-17), Pick’s disease (PiD), progressive supranuclear palsy (PSP), corticobasal degeneration, argyrophilic grain disease, globular glial tauopathy, and chronic traumatic encephalopathy, collectively termed tauopathies. Levels of tau show a stronger correlation with cognitive dysfunction in AD than those of the amyloid-β peptide (Aβ) (17, 18), suggesting that tau is the critical mediator of neurodegeneration in tauopathies. However, the exact pathologic etiology of these heterogeneous diseases needs to be further determined. Since hyperphosphorylated tau was identified as the major component of NFTs in the mid-eighties, the phosphorylation events of tau have been considered the rate-determining step of tau fibrillization. Subsequent findings, that tau phosphorylation occurs mainly in PRDs (~22 sites out of 93 amino acids in the PRD can be phosphorylated), reduces tau affinity to microtubules, facilitates tau self-fibrillization, and subsequently results in microtubule destabilization led to the fundamental hypothesis that blocking tau phosphorylation would delay the pathological development of tauopathies. Nevertheless, various pharmacological inhibitors targeting tau phosphorylation showed no significant benefits in reversing cognitive decline in patients (19). These negative data do not necessarily preclude the strategy of targeting tau kinases, but rather indicate that the effects of tau phosphorylation on its aggregation are dependent on the kinases involved or the modification site. However, many studies now report that the actual role of tau phosphorylation appears to be much less significant than initially envisioned and it may be worth considering other complementary strategies to modulate tau aggregation. While the precise mechanism responsible for the formation of tau aggregates remains unclear, considering the extraordinarily widespread phenomenon of tauopathies among the aged population and enormous heterogeneity of tau PTMs, it is unlikely that there are only one or two critical factors triggering tau aggregation. It is more conceivable that tau has an autonomous tendency towards gaining multiple PTMs with pro-aggregation properties, which lead to the formation of pathological seeds and furthermore self-aggregates with aging and under certain stress conditions. Neurons have multiple anti-aggregation strategies to effectively restrain tau aggregation but the ultimate mechanism is considered to be the proteostatic regulation of cellular tau via the ubiquitin-proteasome system (UPS). Therefore, topological combinations of the highly heterogeneous PTMs on tau, rather than individual PTMs, should be decoded to fully understand the pathomechanism of tauopathies. This review summarizes the different types of tau PTMs focusing on phosphorylation, acetylation, and ubiquitination, and highlights the significance of crosstalk among tau PTMs, which is implicated in AD and other tauopathies. Tau undergoes extensive non-phospho-PTMs. While phosphorylation received initial attention as the primary event for the tau aggregation cascade initiation, modifications of tau at the Lys residues, including acetylation, ubiquitination, sumoylation, and methylation, have emerged as equally important PTMs in tauopathy regulation (20). Tau has 44 Lys residues (10% of all amino acids) and extensive acetylation was found mainly in the PRD and MBD (Fig. 2A). Histone acetyltransferase cAMP-response element binding protein (CREB)-binding protein (CBP) and the highly homologous p300 proteins are the key tau acetylases (21–23). p300 and CBP share ~90% sequence homology but have little similarity with other histone acetyltransferase enzymes (24). Notably, tau protein may intrinsically possess auto-acetyltransferase activity capable of acetylating its own Lys residues, using its MBD as the key catalytic site. Therefore, Cys291 and Cys322, the only two Cys residues of tau, have two competing functions: as the key residues in the catalytic center, they enable tau auto-acetylation even in the absence of p300/CBP, and as the residues in the dimerization site of tau, they enable aggregate nuclei formation. Acetylation would neutralize the positive charges of the large number of Lys residues located in the MBD, facilitating disengagement of tau proteins from microtubules and their pathological aggregation (25). Because acetylation and ubiquitination may use the same Lys residues, acetylation is also thought to directly reduce tau ubiquitination and subsequently block its proteasomal degradation (26). For example, acetylation of tau was elevated under pathologic conditions, perturbing tau degradation and resulting in elevated levels of total tau as well as phosphorylated tau (21). The tau deacetylase, histone deacetylase 6 (HDAC6), can directly bind to the MBD and antagonize acetylation of tau, especially on the KXGS motifs (27). High HDAC6 activity is correlated not only with reduced tau acetylation, but also elevated phosphorylation at the Ser residues within the KXGS motifs (28). Therefore, the consequence of HDAC6-mediated deacetylation is the generation of less microtubule-binding, and more aggregation-prone forms of tau (29, 30). Another deacetylase of tau is the NAD+-dependent sirtuin 1 deacetylase (SIRT1) (21). However, contrary to the effect of HDAC6, decreased activity of SIRT1 was associated with enhanced PHF-tau accumulation in AD patients (31), indicating a negative correlation between the regulation of SIRT1 and tau accumulation. HDAC6 and SIRT1 may modify different acetylation sites and produce different pathological consequences. Along these lines, the critical determinant of tau pathogenicity is probably the outcome of a combination of multiple PTM alterations, including acetylation of different sites. Consistent with the function of acetylation that may preclude Lys residues from ubiquitination, mutations altering Lys residues to Gln, mimicking acetylation on human tau proteins, attenuated tau clearance and induced behavioral abnormality in vivo, such as memory and learning impairments (32, 33). Similarly, the Gan group reported that abnormal acetylation of Lys274 and Lys281 on tau was found in human AD brains and transgenic mice expressing the same mutations also exhibited AD-related memory deficits and impaired hippocampal long-term potentiation (LTP) (34). Acetylation of tau at Lys174, Lys274 and Lys280 has been detected post-mortem in AD, FTDP-17, and PiD, suggesting acetylation at these sites may be pathological (33, 35). The pathological mechanisms of tau acetylation, however, differ depending on the modification sites. In addition to its competing function with ubiquitination, acetylation of Lys280 of tau appears to have a negative role on tau-mediated stabilization of microtubules and, conceivably, alters its phosphorylation at both proximal and distal residues (36). The K280Q mutation mimicking tau acetylation in Drosophila and mice showed reduced microtubule bundling, elevated degrees of tau phosphorylation at nearby Ser262 and Thr212/214 residues, and increased total tau amounts (25, 37). Acetylation of tau at Lys280 is expected to occur before pathological tau is fibrillized into PHFs. Immunohistopathological studies revealed that acetylation at Lys280 is observed in the brain of AD and other tauopathies, but not in normal brains, in a distribution pattern similar to hyperphosphorylated tau (38). Although acetylation induces multiple structural and functional changes in tau, it is still undetermined whether tau acetylation generally contributes to tau aggregation or has opposite effects. Acetylation of Lys residues in the KXGS motifs (Lys259, Lys290, Lys321, and Lys353; Fig. 2A) has been reported to prevent phosphorylation at nearby Ser/Thr residues (for example, the reciprocal inhibitory relationship between Lys321 acetylation and Ser324 phosphorylation) in the MBD and to decrease the aggregation propensity of recombinant tau in vitro (27, 39). In patients with AD as well as in rTg(tauP301L)4510 mice (a mouse model of tauopathy), the KXGS motifs are hypoacetylated and hyperphosphorylated, indicating that loss of acetylation on tau may render tau more vulnerable to pathological modifications. On the contrary, tau acetylation at Lys280 and Lys281 (also in the MBD) resulted in microtubule destabilization and promoted tau fibrillization both in tau transgenic mice and human patients (25), suggesting a causative, instead of a protective, role in tauopathies. Targeting specific residues appears to be critical for developing a PTM-modifying therapeutic strategy for tauopathies. A total of 85 phosphorylatable residues (45 Ser, 35 Thr, and 5 Tyr) are present on tau40. About 50% of them are detected as phosphorylation sites by mass spectrometry (MS), mostly located in the PRD and the C-terminal region (Fig. 2A). Phosphorylation of tau was extensively studied mainly because when it occurs in excess (i.e., hyperphosphorylation), tau protein is dissociated from microtubules, accumulated in neurons, and self-assembled to form intracellular tau tangles. Many in vitro and in vivo studies have already established a close link between abnormal tau phosphorylation and aggregation, accompanied by destabilization of microtubules (40–43). Although it is the most described PTM of tau, it needs to be reconsidered whether tau phosphorylation is indeed the earliest event in AD and other tauopathies. Although filamentous accumulation of hyperphosphorylated tau in neurons is the signature of tauopathies, the etiological role of tau phosphorylation still remains to be characterized. In addition, hyperphosphorylation or phosphorylation degrees have very subjective criteria. Presence of 2–3 phosphate molecules per individual tau molecule is considered normal, whereas more than 7–8 phosphates on tau can be regarded as hyperphosphorylation (44, 45). Therefore, tau hyperphosphorylation is more likely to be reflective of increased phosphorylation of tau at certain residues, instead of extensive phosphorylation throughout the tau protein. Phosphorylation of tau at multiple sites requires the precise interplay of a multitude of kinases and phosphatases. Significant effort has been made to identify these enzymes, their physiological target sites, and the pathological imbalance in their activity. Identified tau kinases include glycogen synthase kinase 3β (GSK3β), cyclin-dependent kinase 5 (CDK5), CDK2, Ca2+/calmodulin-dependent protein kinase II (CaMKII), microtubule-affinity regulating kinase (MARK), protein kinase A (PKA), PKB/AKT, PKC, and tyrosine kinases such as Src family kinases, including Src, Fyn, and c-Abl (46). Since these kinases have been mostly identified through in vitro reconstitution assays, their biological relevance should be further validated because of the inherent promiscuity of kinases. In line with the effort to precisely link a specific phosphorylated residue(s) of tau with a disease state of certain tauopathies, a number of antibodies have been developed. For instance, the antibody AT8 recognizes tau phosphorylation at Ser202, Thr205, and Ser208 and is widely used as a marker for pre-tangle tau aggregates for assessing the AD-related neurofibrillary pathology (47). Tau filaments can also be immunohistochemically detected by the AT100 antibodies recognizing Thr212 and Ser214. Phospho-specific antibodies can be used for earlier detection of pathologic forms of tau if proper samples are accessible, prior to being generated into fully developed fibrillar deposits which are more readily detected with β-sheet specific dyes. Antibodies raised against specific PTMs on one or a few residues are invaluably useful, both for basic and preclinical research. Nonetheless, considering the various factors involved in immunoassays, validation of these antibodies using knockout tissues and diverse peptide arrays is necessary for more reliable and robust detection. GSK3β can modify more than 30 phosphorylation sites and its overexpression in mouse brain resulted in tau hyperphosphorylation and neurodegeneration (48). Treatment with lithium, a classic inhibitor of GSK3 and an FDA-approved approved drug for bipolar disorder, produced beneficial cognitive effects in mouse models of AD and even in AD patients (49–51). These results suggested that GSK3β could be a promising target for developing therapeutic strategies to delay tau aggregation and AD progression. However, in clinical trials, synthetic GSK3β inhibitors have shown no beneficial effects in reversing tauopathic symptoms, indicating that blocking phosphorylation through GSK3β is not sufficient to change the intrinsic aggregation propensity of tau during the pathological course. The phosphorylation status of tau is also differentially regulated during brain development and other physiological conditions as well (52, 53). Hyperphosphorylation of tau may originate from reduced activity of phosphatases instead of elevation of kinase activity. Protein phosphatases (PP) 1, PP2A, PP2B, PP2C, PP3, and PP5 are possible phosphatases responsible for tau dephosphorylation (54). Among them, PP2A is known to account for approximately 70% of tau phosphatase activity in the human brain (55). Decreased PP2A activity observed in AD brain may contribute to abnormal tau hyperphosphorylation (56, 57). Okadaic acid is often used to inhibit cellular PP1 and PP2A activity and subsequently elevate the levels of hyperphosphorylated tau in cultured cell and animal models (58–61). Notably, the mammalian target of rapamycin (mTOR), which negatively modulates autophagy by phosphorylating Atg1, an autophagy initiating factor (62), also negatively regulates PP2A activity. Therefore, inhibition of mTOR activity upon nutrient starvation or carbon depletion, may result in both PP2A activation and autophagy upregulation, relieving the pathological consequences of tau hyperphosphorylation and aggregation. A positive regulatory relation between the phosphorylation and acetylation of tau has been proposed; phosphorylation in the MBDs activates the autoacetyltransferase activity of tau and expands acetylation of tau (63). Phosphorylation of tau at the KXGS motifs negatively regulates tau ubiquitination; phospho-Ser interferes with its interaction with the tau ubiquitin ligase C-terminus of Hsc70 interacting protein (CHIP), subsequently elevating levels of free tau and tau aggregates (64, 65). While it is clear that tau phosphorylation is related to microtubule dynamics/stability and NFT formation kinetics, cumulating evidence also suggests that a soluble pool of hyperphosphorylated tau itself is not necessarily a causal factor of tauopathy. One of the first biochemical studies using isolated human PHF-tau species indicated that phosphorylation of tau concurrently occurs with other modifications especially at Lys residues; pI was reduced from ~8.2 of unmodified tau to 5.5–6.5 of PHF-tau, and this contained 35% less Lys when analyzed by Edman degradation (66). Considering the uncertain role of tau phosphorylation alone in driving tau pathogenesis, characterizing the crosstalk among tau PTMs is imperative to identify an underlying pathogenic mechanism that occurs during the onset or progression of tauopathies. The pathological link between tau and ubiquitination has been suspected since the finding of extensive localization of Ub in the senile plaques of AD patients (67–70), where Ub exists in either free forms or as protein-conjugates. Compared to non-AD controls, tau proteins were highly ubiquitinated in the brain of human AD patients. Recent MS and immunological studies have identifies that tau has not only Lys48-linked polyUb chains but also Lys6-, Lys11-, and Lys63-linked forms (71–75). PHF-tau isolated from human AD brains was co-immunoprecipitated with various proteasome subunits, probably indicating inefficient processing at the proteasome (76). The proteasome activity was reported to decrease upon binding of unprocessible substrates including filamentous forms of tau. This may be a reason for the observation that overall degradative activity of UPS was significantly impaired in post-mortem human AD brains (77, 78). Degradation of endogenous and overexpressed tau was significantly impeded by various types of proteasome inhibitors (67, 79, 80). Therefore, the significance of these ubiquitinated tau (Ub-tau) species is evident from the fact that the impairment of UPS-mediated proteolysis clearly contributes to tau homeostasis and ultimately to AD pathology. Increased levels of Ub-tau were found in cerebrospinal fluid (CSF) of AD patients as well (81, 82). If Ub-tau is leaked from the damaged blood-CSF barrier in AD, these species could be used as a good biomarker for early AD diagnosis, possibly related with dysfunctions of circulating proteasomes. Prior to proteasomal degradation, tau ubiquitination, especially at Lys254, Lys311, and Lys353, all of which are located on MBDs, may first weaken the tau-microtubule binding affinity (Fig. 2A). Several E3 ligases are reported to ubiquitinate tau, which include CHIP, tumor necrosis factor receptor-associated factor 6 (TRAF6), and axotrophin/MARCH7 (83–86). CHIP uses UbcH5/UBE2D as an E2 enzyme and Hsp70 as a coenzyme (but it is non-essential for in vitro tau ubiquitination), mainly recognizing the MBD and PRD of tau. CHIP contains the U-box domain, which adopts a folding structure similar to the RING domain but lacking a Zn ion, for recognition of E2 enzymes and for Ub transfer to tau (87). By promoting tau quality control, overexpression of CHIP attenuated the toxicity of hyperphosphorylated tau and maintained neuronal survival (86, 87). Consistent with this, a quantitative analysis using mouse and human brains revealed that levels of CHIP and Hsp70 had inverse correlation with the levels of insoluble tau aggregates (88), strongly suggesting that CHIP-mediated ubiquitination of tau is an important negative regulator of tauopathies. CHIP, along with its stress-activated E2s and Hsp70, has diverse target proteins, contributing as one of the most important global regulators of cellular balance between the cell’s protein folding-refolding machinery and its degradation machinery (89). Hence, it would not be an oversimplification to conclude that CHIP is a good target for devising a strategy against tauopathy-mediated neurotoxicities. However, despite this conceptual consensus, a notable method to utilize CHIP’s protective effect has not been reported so far. On account of its natively-disordered character, tau can be recognized and degraded by the 20S proteasome in an Ub-independent manner. The contribution of this proteolysis to normal tau proteostasis, as well as clearance of its pathological forms, is yet to be compared to Ub-dependent proteolysis. Many results have indicated that tau undergoes slow but constant proteasomal degradation under physiological states. Considering that the half-life of tau is relatively longer than most of the other natively disordered proteins, tau seems to require additional PTMs which may alleviate structural constraints, such as excess positive charges, for chaperone interaction or proteasomal degradation. When excess tau exists in cells, tau is expected to be actively ubiquitinated by CHIP and removed by 26S proteasomes. If tau proteins are accumulated beyond the threshold of the proteasomal capacity, ubiquitinated tau may lead to a vicious, reciprocal aggregation cycle because excessive levels of tau proteins may inhibit proteasome activity via the “clogging” effect (90, 91). Newly formed PHFs can directly interact with various proteasome subunits to further block the normal proteasome function preventing the clearance of tau (76, 91). This cycle may explain the decline in overall UPS activity in post-mortem human AD brains (77, 92). However, it should be determined whether ubiquitination of tau, if combined with other PTMs, can trigger a pathological event in the AD cascade, independent of its degradation by the UPS. More specifically, CHIP-mediated tau ubiquitination may depend on its phosphorylation states, both physiological and diseased (64), and may promote phosphorylation and aggregation events of tau. Tau ubiquitination at the KXIG motifs and the hexapeptide units (Fig. 2A) would result in consequences similar to those of phosphorylation: reduced overall positive charges and dissociation from the microtubules. Therefore, tau ubiquitination occurring after its hyperphosphorylation, may facilitate the aggregation process, rather than leading to its Ub-dependent proteasomal degradation, especially AD patients with decreased proteasome activity. In this condition, CHIP activation may not promote UPS-mediated tau clearance but only result in detrimental consequences from enhanced aggregation of pathologic tau. Unlike other neurodegenerative diseases, no strong genetic mutation is associated with tauopathies. This suggests that it is highly likely that extensive PTMs, instead of genetic mutations, are responsible for their etiological events. A wide variety of PTMs were found on tau (Fig. 2) and it is becoming increasingly apparent that they are constantly and dynamically changing. Moreover, instead of single PTMs, their combinations are more relevant to the pathogenesis of tauopathies. Apart from the three major modifications covered by us in this review, acetylation, phosphorylation, and ubiquitination, other PTMs will also inevitably affect the physiochemical properties of tau. For examples, the Lys residues in the MBDs can also be modified by glycation, methylation, or disulfide bond formation, and the nearby Ser/Thr residues can be targeted by O-GlcNAcylation. These PTMs will affect the interaction with microtubules, degrees of other PTMs, and tau self-fibrillization tendency. Because the MBD contains the chaperone-mediated autophagy targeting motifs (347KDRVQ351), the consequences of PTMs functionally include both UPS-mediated and autophagy-mediated degradation. The cryo-electron microscopic (cryo-EM) structure of tau filaments (PHFs and SHs) from the cerebral cortex of human AD patients was recently identified (Fig. 2B) and it was very different from those grown in vitro or from what was expected from biochemical studies (16). The atomic structure revealed that the tau filaments consist of two C-shaped protofilaments comprising mainly R3 and R4, either symmetrically (this generates PHFs) or asymmetrically (SFs). As expected, a tau protofilament contains extensive PTM modification sites, including 11 Lys residues out of total 73 residues (Fig. 2B). In addition to the structural information of tau aggregates, knowledge on the PTMs and their dynamics under pathological conditions is highly desired to develop rationally designed therapeutics that may delay the aggregation of tau protofilament cores. As we have seen in other PTMs, the consequences of PTMs on tau protofilaments are expected to be both beneficial and detrimental, depending on their target sites. Biochemical research on tau demonstrates that a number of molecular events (PTMs) result in one pathologic signature (tau aggregation), giving rise to a nosological entity (tauopathies). Transition of tau from a highly soluble protein to insoluble aggregates must require extensive changes in tau, instead of a single or a few missense mutations. It has been known for a while that tau proteins frequently undergo a stepwise fragmentation process to generate truncated forms of tau and that some of them show pro-aggregation and pro-propagation properties (93). Since a more defined target, which is the protofilament core consisting of 306–378 residues of tau, is identified, one can anticipate that the true mechanisms of tau aggregation involving key PTM processes will also be determined soon. Identifying cathepsins, caspases, or other endopeptidases responsible for generating the tau core may have practical implications in early stage identification and prevention of tauopathies. It will also provide critical information to both basic and clinical scientists to identify whether the tau protofilaments are cleared by the UPS or the autophagy system. This work was supported by grants of the National Research Foundation (NRF) of Korea (2016R1C1B2011367 to J.H.L., 2017R1A6A3A11029936 to S.Y.P., 2016R1A2B2006507 to M.J.L. ), the Brain Research Program (2016M3C7A1913895 to M.J.L. ), and the Creative-Pioneering Researchers Program (800-20170325) of Seoul National University and the Convergence Research Program (02-2018-5) of SNU Boramae Medical Center. Fig. 1. Structural organization of tau isoforms. Six tau isoforms are encoded by the single MAPT gene. The shortest tau isoform is the 3R/0N (three repeats [R1, R3, and R4] in the microtubule binding domain and zero products from exon 2 and 3 [N1 and N2] in the N-domain) that contain 352 amino acids. The longest isoform of human tau is the 4R/2N with 441 amino acids. Exon 10 encodes the second repeat (R2) of the MBD. The expression of tau isoforms is differentially regulated by developmental stages and specific cell types/locations in the brain, and also possibly affected by the progression of tauopathies. Fig. 2. Post-translational modification (PTM) sites of human tau. (A) Representative PTMs on the 4R/2N isoform of tau. Three confirmed ubiquitination sites (all in the MBD) are labeled with green bars. Phosphorylation sites are indicated with red (found in AD brain only) or black bars (found both in normal and AD brain). Sites that are acetylated by p300 and/or CPB are depicted with blue bars. Two hexapeptide motifs (275VQIINK280 and 306VQIVYK311) and two Cys residues (Cys291 and Cys322) in tau are located within R2 and R3. (B) The PTMs on the tau protofilament core, which spans residues 306 to 378 with R3, R4, and a portion of the C-terminal region, and its structure identified from human AD brain. The tau core contains one hexapeptide motif (306VQIVYK311), one Cys residue (Cys322), two KXGS motifs, six acetylation, two ubiquitination, and one phosphorylation sites. Same color schemes as described above are used to depict the PTMs. Mandelkow EM, and Mandelkow E (1998) Tau in Alzheimer’s disease. Trends Cell Biol 8, 425-427. Andreadis A (2006) Misregulation of tau alternative splicing in neurodegeneration and dementia. Prog Mol Subcell Biol 44, 89-107. Goedert M, Spillantini MG, Jakes R, Rutherford D, and Crowther RA (1989) Multiple isoforms of human microtubule-associated protein tau: sequences and localization in neurofibrillary tangles of Alzheimer’s disease. Neuron 3, 519-526. Goedert M, Cohen ES, Jakes R, and Cohen P (1992) p42MAP kinase phosphorylation sites in microtubule-associated protein tau are dephosphorylated by protein phosphatase 2A1. Implications for Alzheimer’s disease [corrected]. FEBS Lett 312, 95-99. Kyte J, and Doolittle RF (1982) A simple method for displaying the hydropathic character of a protein. J Mol Biol 157, 105-132. Alonso AD, Zaidi T, Novak M, Barra HS, Grundke-Iqbal I, and Iqbal K (2001) Interaction of tau isoforms with Alzheimer’s disease abnormally hyperphosphorylated tau and in vitro phosphorylation into the disease-like protein. J Biol Chem 276, 37967-37973. Wolfe MS (2009) Tau mutations in neurodegenerative diseases. J Biol Chem 284, 6021-6025. Abraha A, Ghoshal N, and Gamblin TC (2000) C-terminal inhibition of tau assembly in vitro and in Alzheimer’s disease. J Cell Sci 113, 3737-3745. Flores-Rodriguez P, Ontiveros-Torres MA, and Cardenas-Aguayo MC (2015) The relationship between truncation and phosphorylation at the C-terminus of tau protein in the paired helical filaments of Alzheimer’s disease. Front Neurosci 9, 33. Peeraer E, Bottelbergs A, and Van Kolen K (2015) Intracerebral injection of preformed synthetic tau fibrils initiates widespread tauopathy and neuronal loss in the brains of tau transgenic mice. Neurobiol Dis 73, 83-95. Guo JL, and Lee VM (2013) Neurofibrillary tangle-like tau pathology induced by synthetic tau fibrils in primary neurons over-expressing mutant tau. FEBS Lett 587, 717-723. Guo JL, and Lee VM (2011) Seeding of normal Tau by pathological Tau conformers drives pathogenesis of Alzheimer-like tangles. J Biol Chem 286, 15317-15331. Nubling G, Bader B, Levin J, Hildebrandt J, Kretzschmar H, and Giese A (2012) Synergistic influence of phosphorylation and metal ions on tau oligomer formation and coaggregation with alpha-synuclein at the single molecule level. Mol Neurodegener 7, 35. Choi TS, Lee J, and Han JY (2018) Supramolecular Modulation of Structural Polymorphism in Pathogenic alpha-Synuclein Fibrils Using Copper(II) Coordination. Angew Chem Int Ed Engl 57, 3099-3103. Wille H, Drewes G, Biernat J, Mandelkow EM, and Mandelkow E (1992) Alzheimer-like paired helical filaments and antiparallel dimers formed from microtubule-associated protein tau in vitro. J Cell Biol 118, 573-584. Fitzpatrick AWP, Falcon B, and He S (2017) Cryo-EM structures of tau filaments from Alzheimer’s disease. Nature 547, 185-190. Giannakopoulos P, Herrmann FR, and Bussiere T (2003) Tangle and neuron numbers, but not amyloid load, predict cognitive status in Alzheimer’s disease. Neurology 60, 1495-1500. Ethell DW (2010) An amyloid-notch hypothesis for Alzheimer’s disease. Neuroscientist 16, 614-617. Hung SY, and Fu WM (2017) Drug candidates in clinical trials for Alzheimer’s disease. J Biomed Sci 24, 47. Wang Y, and Mandelkow E (2016) Tau in physiology and pathology. Nat Rev Neurosci 17, 5-21. Min SW, Cho SH, and Zhou Y (2010) Acetylation of tau inhibits its degradation and contributes to tauopathy. Neuron 67, 953-966. Roth SY, Denu JM, and Allis CD (2001) Histone acetyltransferases. Annu Rev Biochem 70, 81-120. 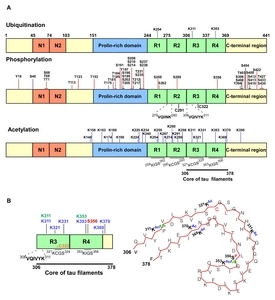 Liu X, Wang L, and Zhao K (2008) The structural basis of protein acetylation by the p300/CBP transcriptional coactivator. Nature 451, 846-850. Marmorstein R (2001) Structure of histone acetyltransferases. J Mol Biol 311, 433-444. Cohen TJ, Guo JL, and Hurtado DE (2011) The acetylation of tau inhibits its function and promotes pathological tau aggregation. Nat Commun 2, 252. Morris M, Knudsen GM, and Maeda S (2015) Tau post-translational modifications in wild-type and human amyloid precursor protein transgenic mice. Nat Neurosci 18, 1183-1189. Cook C, Carlomagno Y, and Gendron TF (2014) Acetylation of the KXGS motifs in tau is a critical determinant in modulation of tau aggregation and clearance. Hum Mol Genet 23, 104-116. Ding H, Dolan PJ, and Johnson GV (2008) Histone deacetylase 6 interacts with the microtubule-associated protein tau. J Neurochem 106, 2119-2130. Fan SJ, Huang FI, Liou JP, and Yang CR (2018) The novel histone de acetylase 6 inhibitor, MPT0G211, ameliorates tau phosphorylation and cognitive deficits in an Alzheimer’s disease model. Cell Death Dis 9, 655. Carlomagno Y, Chung DC, and Yue M (2017) An acetylation-phosphorylation switch that regulates tau aggregation propensity and function. J Biol Chem 292, 15277-15286. Julien C, Tremblay C, and Emond V (2009) Sirtuin 1 reduction parallels the accumulation of tau in Alzheimer disease. J Neuropathol Exp Neurol 68, 48-58. Gorsky MK, Burnouf S, and Sofola-Adesakin O (2017) Pseudo-acetylation of multiple sites on human Tau proteins alters Tau phosphorylation and microtubule binding, and ameliorates amyloid beta toxicity. Sci Rep 7, 9984. Min SW, Chen X, and Tracy TE (2015) Critical role of acetylation in tau-mediated neurodegeneration and cognitive deficits. Nat Med 21, 1154-1162. Tracy TE, Sohn PD, and Minami SS (2016) Acetylated Tau Obstructs KIBRA-Mediated Signaling in Synaptic Plasticity and Promotes Tauopathy-Related Memory Loss. Neuron 90, 245-260. Irwin DJ, Cohen TJ, and Grossman M (2013) Acetylated tau neuropathology in sporadic and hereditary tauopathies. Am J Pathol 183, 344-351. Trzeciakiewicz H, Tseng JH, and Wander CM (2017) A Dual Pathogenic Mechanism Links Tau Acetylation to Sporadic Tauopathy. Sci Rep 7, 44102. Gorsky MK, Burnouf S, Dols J, Mandelkow E, and Partridge L (2016) Acetylation mimic of lysine 280 exacerbates human Tau neurotoxicity in vivo. Sci Rep 6, 22685. Irwin DJ, Cohen TJ, and Grossman M (2012) Acetylated tau, a novel pathological signature in Alzheimer’s disease and other tauopathies. Brain 135, 807-818. Luo Y, Ma B, Nussinov R, and Wei G (2014) Structural Insight into Tau Protein’s Paradox of Intrinsically Disordered Behavior, Self-Acetylation Activity, and Aggregation. J Phys Chem Lett 5, 3026-3031. Santa-Maria I, Hernandez F, Martin CP, Avila J, and Moreno FJ (2004) Quinones facilitate the self-assembly of the phosphorylated tubulin binding region of tau into fibrillar polymers. Biochemistry 43, 2888-2897. Perez M, Hernandez F, Lim F, Diaz-Nido J, and Avila J (2003) Chronic lithium treatment decreases mutant tau protein aggregation in a transgenic mouse model. J Alzheimers Dis 5, 301-308. Noble W, Planel E, and Zehr C (2005) Inhibition of glycogen synthase kinase-3 by lithium correlates with reduced tauopathy and degeneration in vivo. Proc Natl Acad Sci U S A 102, 6990-6995. Avila J (2006) Tau phosphorylation and aggregation in Alzheimer’s disease pathology. FEBS Lett 580, 2922-2927. Kopke E, Tung YC, Shaikh S, Alonso AC, Iqbal K, and Grundke-Iqbal I (1993) Microtubule-associated protein tau. Abnormal phosphorylation of a non-paired helical filament pool in Alzheimer disease. J Biol Chem 268, 24374-24384. Kenessey A, and Yen SH (1993) The extent of phosphorylation of fetal tau is comparable to that of PHF-tau from Alzheimer paired helical filaments. Brain Res 629, 40-46. Lee G, Thangavel R, and Sharma VM (2004) Phosphorylation of tau by fyn: implications for Alzheimer’s disease. J Neurosci 24, 2304-2312. Braak E, Braak H, and Mandelkow EM (1994) A sequence of cytoskeleton changes related to the formation of neurofibrillary tangles and neuropil threads. Acta Neuropathol 87, 554-567. Lucas JJ, Hernandez F, Gomez-Ramos P, Moran MA, Hen R, and Avila J (2001) Decreased nuclear beta-catenin, tau hyperphosphorylation and neurodegeneration in GSK-3beta conditional transgenic mice. EMBO J 20, 27-39. Forlenza OV, Aprahamian I, de Paula VJ, and Hajek T (2016) Lithium, a Therapy for AD: Current Evidence from Clinical Trials of Neurodegenerative Disorders. Curr Alzheimer Res 13, 879-886. King MK, Pardo M, Cheng Y, Downey K, Jope RS, and Beurel E (2014) Glycogen synthase kinase-3 inhibitors: Rescuers of cognitive impairments. Pharmacol Ther 141, 1-12. Matsunaga S, Kishi T, Annas P, Basun H, Hampel H, and Iwata N (2015) Lithium as a Treatment for Alzheimer’s Disease: A Systematic Review and Meta-Analysis. J Alzheimers Dis 48, 403-410. Yu Y, Run X, and Liang Z (2009) Developmental regulation of tau phosphorylation, tau kinases, and tau phosphatases. J Neurochem 108, 1480-1494. Noble W, Hanger DP, Miller CC, and Lovestone S (2013) The importance of tau phosphorylation for neurodegenerative diseases. Front Neurol 4, 83. Sontag JM, and Sontag E (2014) Protein phosphatase 2A dysfunction in Alzheimer’s disease. Front Mol Neurosci 7, 16. Liu F, Grundke-Iqbal I, Iqbal K, and Gong CX (2005) Contributions of protein phosphatases PP1, PP2A, PP2B and PP5 to the regulation of tau phosphorylation. Eur J Neurosci 22, 1942-1950. Gong CX, Shaikh S, Wang JZ, Zaidi T, Grundke-Iqbal I, and Iqbal K (1995) Phosphatase activity toward abnormally phosphorylated tau: decrease in Alzheimer disease brain. J Neurochem 65, 732-738. Gong CX, Singh TJ, Grundke-Iqbal I, and Iqbal K (1993) Phosphoprotein phosphatase activities in Alzheimer disease brain. J Neurochem 61, 921-927. Choi WH, de Poot SA, and Lee JH (2016) Open-gate mutants of the mammalian proteasome show enhanced ubiquitin-conjugate degradation. Nat Commun 7, 10963. Han DH, Na HK, and Choi WH (2014) Direct cellular delivery of human proteasomes to delay tau aggregation. Nat Commun 5, 5633. Jiang Y, Lee J, and Lee JH (2016) The arginylation branch of the N-end rule pathway positively regulates cellular autophagic flux and clearance of proteotoxic proteins. Autophagy 12, 2197-2212. Kim JH, Kim E, and Choi WH (2016) Inhibitory RNA Aptamers of Tau Oligomerization and Their Neuroprotective Roles against Proteotoxic Stress. Mol Pharm 13, 2039-2048. Karabiyik C, Lee MJ, and Rubinsztein DC (2017) Autophagy impairment in Parkinson’s disease. Essays Biochem 61, 711-720. Cohen TJ, Friedmann D, Hwang AW, Marmorstein R, and Lee VM (2013) The microtubule-associated tau protein has intrinsic acetyltransferase activity. Nat Struct Mol Biol 20, 756-762. Dickey CA, Kamal A, and Lundgren K (2007) The high-affinity HSP90-CHIP complex recognizes and selectively degrades phosphorylated tau client proteins. J Clin Invest 117, 648-658. Dickey CA, Dunmore J, and Lu B (2006) HSP induction mediates selective clearance of tau phosphorylated at proline-directed Ser/Thr sites but not KXGS (MARK) sites. FASEB J 20, 753-755. Liu WK, Ksiezak-Reding H, and Yen SH (1991) Abnormal tau proteins from Alzheimer’s disease brains. Purification and amino acid analysis. J Biol Chem 266, 21723-21727. David DC, Layfield R, Serpell L, Narain Y, Goedert M, and Spillantini MG (2002) Proteasomal degradation of tau protein. J Neurochem 83, 176-185. Grune T, Botzen D, and Engels M (2010) Tau protein degradation is catalyzed by the ATP/ubiquitin-independent 20S proteasome under normal cell conditions. Arch Biochem Biophys 500, 181-188. Mori H, Kondo J, and Ihara Y (1987) Ubiquitin is a component of paired helical filaments in Alzheimer’s disease. Science 235, 1641-1644. Perry G, Friedman R, Shaw G, and Chau V (1987) Ubiquitin is detected in neurofibrillary tangles and senile plaque neurites of Alzheimer disease brains. Proc Natl Acad Sci U S A 84, 3033-3036. Cripps D, Thomas SN, Jeng Y, Yang F, Davies P, and Yang AJ (2006) Alzheimer disease-specific conformation of hyperphosphorylated paired helical filament-Tau is polyubiquitinated through Lys-48, Lys-11, and Lys-6 ubiquitin conjugation. J Biol Chem 281, 10825-10838. Morishima-Kawashima M, Hasegawa M, Takio K, Suzuki M, Titani K, and Ihara Y (1993) Ubiquitin is conjugated with amino-terminally processed tau in paired helical filaments. Neuron 10, 1151-1160. Paine S, Bedford L, and Thorpe JR (2009) Immunoreactivity to Lys63-linked polyubiquitin is a feature of neurodegeneration. Neurosci Lett 460, 205-208. Tan JM, Wong ES, and Kirkpatrick DS (2008) Lysine 63-linked ubiquitination promotes the formation and autophagic clearance of protein inclusions associated with neurodegenerative diseases. Hum Mol Genet 17, 431-439. Tan Z, Sun X, and Hou FS (2007) Mutant ubiquitin found in Alzheimer’s disease causes neuritic beading of mitochondria in association with neuronal degeneration. Cell Death Differ 14, 1721-1732. Keck S, Nitsch R, Grune T, and Ullrich O (2003) Proteasome inhibition by paired helical filament-tau in brains of patients with Alzheimer’s disease. J Neurochem 85, 115-122. Keller JN, Hanni KB, and Markesbery WR (2000) Impaired proteasome function in Alzheimer’s disease. J Neurochem 75, 436-439. Lopez Salon M, Morelli L, Castano EM, Soto EF, and Pasquini JM (2000) Defective ubiquitination of cerebral proteins in Alzheimer’s disease. J Neurosci Res 62, 302-310. Cardozo C, and Michaud C (2002) Proteasome-mediated degradation of tau proteins occurs independently of the chymotrypsin-like activity by a nonprocessive pathway. Arch Biochem Biophys 408, 103-110. Zhang JY, Liu SJ, Li HL, and Wang JZ (2005) Microtubule-associated protein tau is a substrate of ATP/Mg(2+)-dependent proteasome protease system. J Neural Transm 112, 547-555.
de Vrij FM, Fischer DF, van Leeuwen FW, and Hol EM (2004) Protein quality control in Alzheimer’s disease by the ubiquitin proteasome system. Prog Neurobiol 74, 249-270. Lee MJ, Lee JH, and Rubinsztein DC (2013) Tau degradation: the ubiquitin-proteasome system versus the autophagy-lysosome system. Prog Neurobiol 105, 49-59. Petrucelli L, Dickson D, and Kehoe K (2004) CHIP and Hsp70 regulate tau ubiquitination, degradation and aggregation. Hum Mol Genet 13, 703-714. Babu JR, Geetha T, and Wooten MW (2005) Sequestosome 1/p62 shuttles polyubiquitinated tau for proteasomal degradation. J Neurochem 94, 192-203. Flach K, Ramminger E, and Hilbrich I (Array) Axotrophin/MARCH7 acts as an E3 ubiquitin ligase and ubiquitinates tau protein in vitro impairing microtubule binding. Biochim Biophys Acta, 1527-1538. Shimura H, Schwartz D, Gygi SP, and Kosik KS (2004) CHIP-Hsc70 complex ubiquitinates phosphorylated tau and enhances cell survival. J Biol Chem 279, 4869-4876. Hatakeyama S, Matsumoto M, and Kamura T (2004) U-box protein carboxyl terminus of Hsc70-interacting protein (CHIP) mediates poly-ubiquitylation preferentially on four-repeat Tau and is involved in neurodegeneration of tauopathy. J Neurochem 91, 299-307. Sahara N, Murayama M, and Mizoroki T (2005) In vivo evidence of CHIP up-regulation attenuating tau aggregation. J Neurochem 94, 1254-1263. Joshi V, Amanullah A, Upadhyay A, Mishra R, Kumar A, and Mishra A (2016) A Decade of Boon or Burden: What Has the CHIP Ever Done for Cellular Protein Quality Control Mechanism Implicated in Neurodegeneration and Aging?. Front Mol Neurosci 9, 93. Gupta R, Lan M, and Mojsilovic-Petrovic J (2017) The Proline/Arginine Dipeptide from Hexanucleotide Repeat Expanded C9ORF72 Inhibits the Proteasome. eNeuro 4, e0249-16. Shin SK, Kim JH, and Lee JH (2017) Docosahexaenoic acid-mediated protein aggregates may reduce proteasome activity and delay myotube degradation during muscle atrophy in vitro. Exp Mol Med 49, e287. Lee JH, Shin SK, and Jiang Y (2015) Facilitated Tau Degradation by USP14 Aptamers via Enhanced Proteasome Activity. Sci Rep 5, 10757. Wang Y, Garg S, Mandelkow EM, and Mandelkow E (2010) Proteolytic processing of tau. Biochem Soc Trans 38, 955-961.